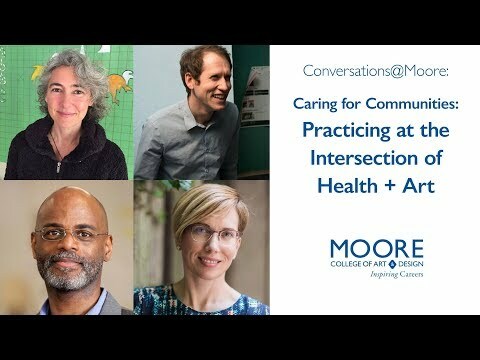 Moore College of Art & Design – Conversations@Moore: "Caring for Communities: Practicing at the Intersection of Health + Art"
Conversations@Moore: "Caring for Communities: Practicing at the Intersection of Health + Art"
This event is part of the Conversations @ Moore series organized by Graduate Studies program. Continuing with our exploration of artists working across diverse disciplines as a means to engage curiosity and participate more deeply in society, this event focuses on art and design practices that intersect with public and community health. Starting with Aaron Levy providing an overview of questions brought about by Slought’s new Health Ecologies Lab project; we will then hear from Terri Kapsalis who has practiced as an artist, researcher and health educator developing projects such as Jane Addams' Travel Medicine Kit for the Hull-House Museum in Chicago; Rob Peagler will share his experiences developing design projects around subjects ranging from end-of-life care to sexual health and wellness. Finally, Megan Voeller, who directs the Humanities program at Thomas Jefferson University, will moderate a discussion between the three presenters that focuses on questions that emerge from their presentations. This event is co-sponsored by Health Ecologies Lab and Jefferson Humanities & Health. Terri Kapsalis is the author of Jane Addams' Travel Medicine Kit (Hull-House Museum), The Hysterical Alphabet (WhiteWalls) and Public Privates: Performing Gynecology from Both Ends of the Speculum (Duke University Press). Along with John Corbett and Anthony Elms, she co-edited Traveling the Spaceways: Sun Ra, the Astro Black, and Other Solar Myths (WhiteWalls) and Pathways to Unknown Worlds: Sun Ra, El Saturn, and Chicago’s Afro-futurist Underground (WhiteWalls) and co-curated the touring exhibition Pathways to Unknown Worlds. Her writings have appeared in such publications as Short Fiction, Denver Quarterly, Parakeet, The Baffler, New Formations and Public. She is a founding member of Theater Oobleck and serves on its artistic board. Since 1991, she has been a collective member and health educator at Chicago Women’s Health Center. She teaches in the departments of Visual and Critical Studies, Liberal Arts and Writing at the School of the Art Institute of Chicago. Rob Peagler is a Philadelphia designer, strategist, artist, and social entrepreneur. He is currently the principal consultant at Social Innovation Associates, where he recently led a skunkworks sexual health and wellness project for the Philadelphia Department of Public Health. He was co-founder and partner at Common Practice, a company that designs tools and strategies to promote scalable conversations about end-of-life issues. Previously, as a partner in The Action Mill, he and his colleagues facilitated systems-change efforts for state and federal health agencies, led the co-design of an arts-and-crafts-based environmental-awareness intervention (mobilizing over 10,000 children in 32 states), and participated as artists in the Manifesta8 biennial. Rob was a fellow at the MIT Center for Reflective Community Practice, co-founded and incubated the Design Studio for Social Intervention there, and conducted R&D work with IBM Research, Steelcase, and Grisha Coleman's echo::system project. Aaron Levy is the Executive Director and Senior Curator at Slought, and Senior Lecturer in the Departments of the History of Art and English at the University of Pennsylvania. At the School of Social Policy and Practice he is the Director of the Health Ecologies Lab and Co-Director of the Arts and Social Justice Initiative, and Strategic Advisor for Health and Humanities Initiatives at Penn Medicine. Levy works with artists, communities, and health systems to develop cultural projects that encourage inclusiveness, advocacy, and the sharing of knowledge about health and well-being. Megan Voeller is a curator, educator and art critic based in Philadelphia, where she serves as Director of Humanities at Thomas Jefferson University. Her practice integrates the facilitation of new work by contemporary artists, the development of creative pedagogy at the intersection of art and health, and the interpretation of art for diverse audiences. At Jefferson, Megan collaboratively designs and implements humanities programs, including elective courses, independent study, and extracurricular activities, that engage students and faculty across disciplines of medicine, nursing, pharmacy, public health and other health professions. With Terri Kapsalis, Rob Peagler, Aaron Levy and Megan Voeller.